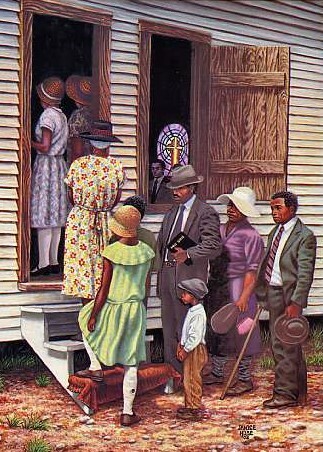 I can remember a time, during my pre-teen years, when the church experience was pure and wonderful. Everything about it was mysterious, in a good way. I had so many questions that my grandmother tried to answer. Her word was good enough for me. But none of the answers satisfied me for the long run. As I grew older, the rose-colored glasses were broken and I saw with the plainness of heart. Things had to change. I needed more understanding and a deeper connection to my Heavenly Father than what I had been taught. In my mind, I thought "if He's my father, I need to know more about him than mere stories and folk tales". And if what I read in the Bible, the Apocrypha, the Torah, the Talmud and any other scripture I could get my hands on is true -then something was definitely missing from my religious experience. I'm not talking about religion in the foolish sense -that foolishness we do on Sunday. No. This is a reference to the very essence of one's being. The built-in attraction to the Creator that each of us possesses. The hidden truth that we're told to "knock" and "seek" after. I discovered that truth in its purest form is hidden from the every-day, ho-hum Jack, and Jill. Most of us have no understanding of and don't know the truth that's hidden in plain sight (pun intended). That's why anybody from anywhere can walk into your church, claiming to be "Prophetess So-and-So" or 'Bishop Smooth Daddy' and gain access to the mind of the people. Which explains why the African American church is in its current state of hot-mess-ness. As for truth being "hidden", perhaps it's YAH's way of proving our motives and agenda to see if we're serious enough about knowing Him to take the "seeking" journey. The question is: Are you willing to seek until you find? Are you part of the remnant? The 144,000? Do you even know what that number represents? If you don't know, it's time to find out. Time and the world as we've known it is experiencing major shifts into what was foretold in scripture. Work it out, people. Work it out. The only way to survive what's coming is to be hidden and shielded inside the power of truth and obedience to YAH. What we witness every day makes Sodom and Gomorrah look like a prime vacation spot. No. This is not a religious blog. This is a blog with a religious topic. Playing with the Divine identity of YAH, while participating in abominable acts during so-called worship services, is deadly. The only worship happening in those environments is devil worship. Take it or leave it. O, you think the term 'abominable' is too extreme? Check this out. This show of abomination has been up on YouTube for three years. I'm willing to wager that those who viewed it found it funny. All I know is, when I realized the dark nature of what I was sitting among on Sunday's, I got the hell out. I've been called a 'backslider', a 'devil' and even 'crazy' for doing so. I refuse to fall for the cliché: the devil is everywhere you go. That's a lie. The devil or Satan is everywhere you invite him. He's not Omnipotent. Nor is he Sovereign. He can't impose himself upon you unless (1) you leave the door open by rejecting YAH, the Sovereign Elohim and His Son, Yahushua Ha Mashiach [Jesus, the Messiah] or (2) you invite him in through sheer ignorance and repeated disobedience. This stuff that the African American church indulges in on Sunday is nothing more than devil worship. YAH has nothing to do with the foolishness these churches claim to do in His name. They serve themselves, not the Heavenly Father. We have itching ears. So, we flock from place to place 'looking for a word'. But you don't want the word of truth. You want lies because the truth will expose you. You want to hear that you're getting a lump sum of money or a new car or a new house -the prosperity lie that's straight from the pit of hell. You want to hear 'all is well' with you, even as you wallow in your messy, sinful life. So, Satan gives you a false prophet to tell you everything you want to hear. All this while deacons, choir members, preachers, bishops, missionaries and lay members indulge in fornication, adultery, and other unspeakable sexual acts with children and each other. The money-grubbers instituted money-making events like pastor appreciation day, missionary day, choir day -and not to mention begging for money for 'a building fund' -that ain't building a damn thang. Elderly members pay into these robbery schemes most of their lives. And when they have a tragic situation and need the church's financial help, they can't get it. The pastor sticks out his pious chest and says: "We gone pray and ask God about it." What??? A few of our 'round-the-way brothas' need to take these fake pulpit pimps to the woodshed and put a beatin' on their broken-down asses. Church, as we knew it, evolved into one big, bold gathering of depravity -with some shouting and 'testi-lying' on the side. Don't marvel. You know I'm right about it. I fear YAH, the Most High just like I was afraid to disobey my physical father. I knew punishment was inevitable if I rebelled against his orders. Therefore, I wouldn't dream of playing with the True and Living Most High of Hosts. He's too wonderful and too dreadful for me to disrespect. We were raised to believe the church was the 'house of God'. We were to be our best selves at all times. In my young mind, that building we visited every Sunday was where God lived. O how wrong I was! Nevertheless, I'm free and forgiven. -what's your excuse? You are so right. The stuff we do on Sunday is anything BUT worship. I used to pay attention to myself when I attended church. Monday morning I might be still on a high from the day before. But when Tuesday rolled around, I was back to my old 'unrighteous' self. Thanks for posting this. It's a refreshing change from all the ear-tickling we're used to. I disagree. Everybody in church is not guilty of this. You can attend church and not be associated with this attitude. This gave me something to think long and hard about. Thanks for posting this. Me too. It's scary to think about. Being a participant inidolatry and being complicit in other sins committed by corrupt preachers. People get mad when you criticize church behavior, but me, I can accept the truth when I hear it or read it or how ever it comes. Truth is truth. And it don't stop being truth when you get upset or disagree with it. Time of the end is nearer than we think. You're absolutely right. When we see all that's happening. The violence, the death, the confusion and degradation. It's all leading up to really trying times. But take heart. These things have to take place before the coming of our Messiah.